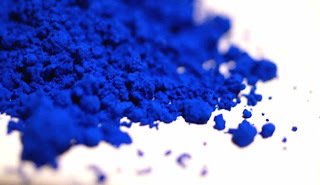 Chemistry brings forth a new color called YInMn blue (yttrium, indium and manganese). All the colors are known. Well, you just write a computer program, give it a graduated scale of each primary color, then let it hold one color constant while going through all combinations of the other colors. However, making a specific color for a product is a problem. Chemicals are usually combined to produce the required shade. A new vivid shade of blue has been discovered. It is called YInMn blue (yttrium, indium and manganese). It will most likely to be used for plastics and commercial coatings. Created by accident, as most new things are, it will liven up our lives - maybe! Researchers were looking for materials with magnetic properties for use in computer drives. They used "manganese dioxide" as a base and mixed it with other chemicals. After heating the compound to 2,000 degrees Fahrenheit they tipped it out and to their amazement saw an almost iridescent blue powder. It was expected to be black like manganese dioxide. The colored compound is color fast for a very long time. This will be useful for artists and painting restorers. Furthermore, the color can be tinted and is nontoxic. We are heading for a greener environment in small steps.